So I finished these over Christmas and worn them several times since then... oh man, these socks are awesome. The pattern is Nancy Bush's Gentleman's Fancy Sock pattern from Vintage Socks, which has become one of my favorite sock pattern books. 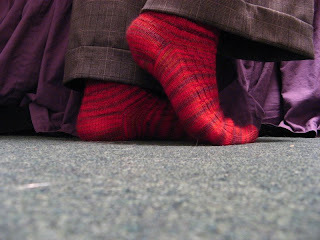 I also invested in Knitting on the Road and the new Knitting Socks with Handpainted Yarns book over the break. Both look pretty exciting, but I'm bringing just Knitting on the Road to Bali with me, since the name is appropriate. I also got some soft pink Malabrigo to make myself a Hat Fit for a Boyfriend, and a ton of delicious sock yarn. Man... I have a problem. 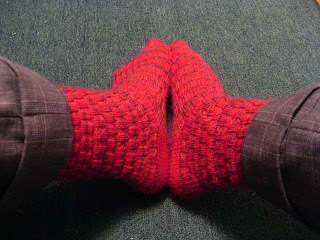 These socks took less than one ball of Schaefer Anne, and I would definitely knit them again, maybe in a different yarn. Perhaps I'll knit some for the Curmudgeon, since this pattern is much stretchier than the last one I attempted! Anyhow... I will be in Indonesia for the next 3-odd weeks, and I'm leaving my computer at home. Hope everyone has a great January! D00d. Handpainted yarn sock book & Knitting on the Road? Sweet. ps. 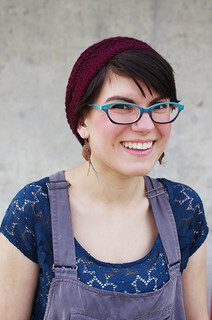 I just favorited a couple patterns from Knitting on the Road. I'd like to take a gander at your library some time.